Each of the controls included in the Telerik® UI for ASP.NET AJAX suite is styled with two CSS files that are loaded in a certain order. The first one - ControlName.css, also called base stylesheet contains CSS properties and values that are common for all skins, i.e it is layout-specific, not skin-specific. These are CSS float, padding, margin, font-size, font-family, etc. In the general case, when creating a custom skin for a control this file should not be edited, unless the custom skin needs different sizes, padding and/ or margins. The second file represents the actual skin of the control, and its name consists of the control name plus the skin name, e.g. - Rating.Default.css. Upon creating a custom skin for the control, one should edit that particular file, as it contains skin-specific CSS properties, and references to images, colors, borders and backgrounds. Unlike the rest of the controls, RadSpell, however uses only one CSS file – Spell.css. 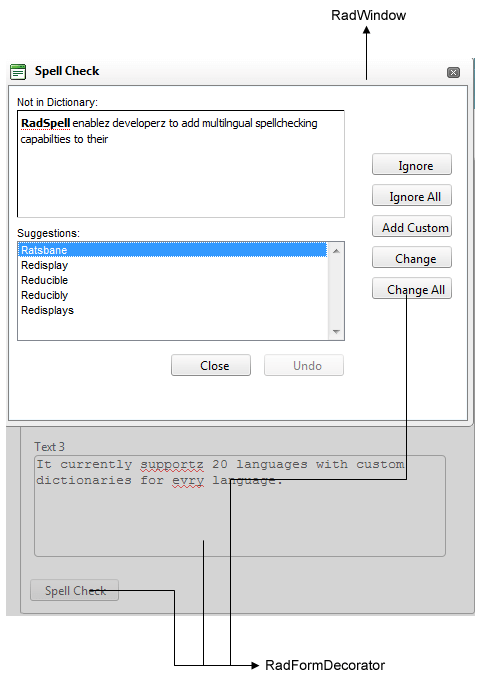 This is so because RadSpell consists of two controls from Telerik AJAX Web UI Suite: RadFormDecorator and RadWidnow. Each one of these controls is styled with two CSS files that are loaded in a certain order.